The tour takes you up to the Unesco protected Boca de Sierra Biosphere Reserve, about 40 minutes north of Cabo San Lucas in Miraflores. 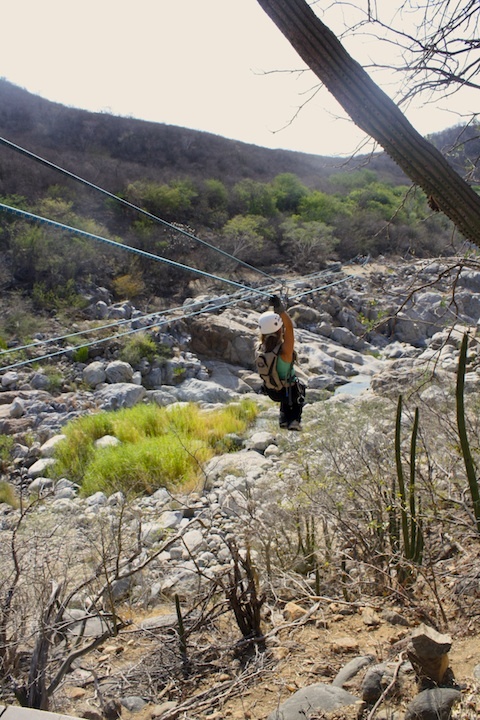 Each zipline is a different and you’ll get to see many of the local flora – cacti, brush etc- as you glide across. There’s some hiking between the different courses and the guides will explain some of the local plants. Our guide even let us try a local fruit. Be sure to stay hydrated as it can get really hot and the ziplining part of the tour lasts about 4 hours. We headed out in the morning before it got to hot and the tour provides camelbacks with water. *Disclosure: We attended this tour free of charge.